I would like to point out the advertisement at the bottom. The correct spelling of Filipino is the way I have written it. 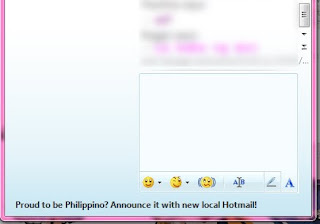 It is not "Philippino". This goes for both the language and the people of the Philippines using the English language. I find it silly and irritating that you ask your Filipino users if they're proud of their citizenship when the spelling of the term is simply wrong. Correct this mistake as it might actually lead to some of my foolish countrymen believing that this is the right way of spelling their own race. tl;dr: It's not "Philippino", it's Filipino. Stop using the Jologs-inator to update your status. It's not funny the first time, and it's not funny now. Then again, that might be the real way you encode. If so, I'm hiding your updates from now on. I'm also considering deleting you just because. tl;dr: d0N't tYpE lyK tHs, kK???!! The jeepney is a public utility vehicle. It does not belong to you even if you are a driver or operator. It belongs to the public—to everyone who rides it and pays for this service. Please do not smoke inside said vehicle, and this goes whether you are a passenger or a driver. It doesn't matter if you're sitting in the front or at the back—the poison you exhale is very much breathable from wherever inside the vehicle. It's already bad that the vehicular exhaust already pollutes and poisons the air. How much more when you add your deadly vice? If you want to smoke, do it in a private place or a public place that allows it. Even if there's no sign that smoking is not allowed, it usually means that it's not. Do not implicate others to shorten their lives as well. It's etiquette, and consequence, that when you take a public vehicle, you must respect others who may not share your vices. There might be people who have respiratory complications that take the jeep too, you know? Then again, perhaps I shouldn't be ranting against you. After all, each stick you consume may be your last. tl;dr: Don't smoke in public vehicles.